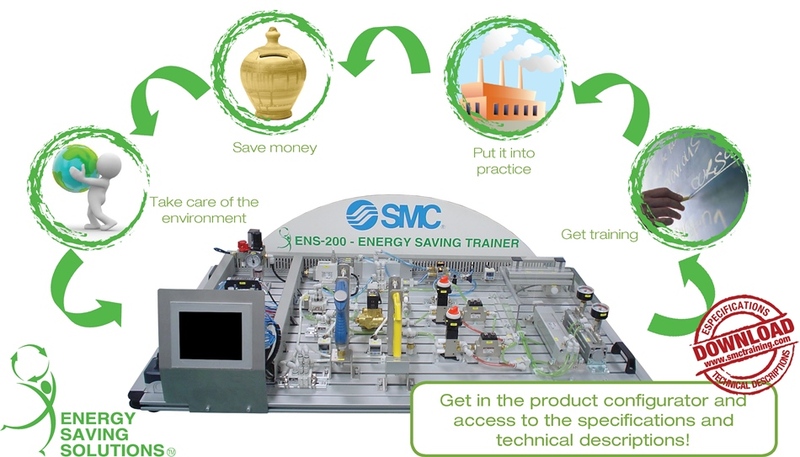 ENS-200 integrates a series of applications (vacuum, actuators and blowing) aimed at understanding and implementing the methodology associated with energy saving in compressed air installations. ENS-200 teaches you how to detect possible excessive consumption and suggest actions to prevent it. Users will analyse different scenarios through a series of guided activities. Each experiment shows how much has been saved, both as a percentage and in the chosen currency. ENS-200 includes an HMI (Human Machine Interface) with a built-in PLC, interactive menus guide the user through the different activities. The system sets up all of the parameters automatically for each exercise. The results from measuring consumption and the savings obtained are presented as a percentage and in monetary savings.